Sell your gold and win a share of $10,000 this month! 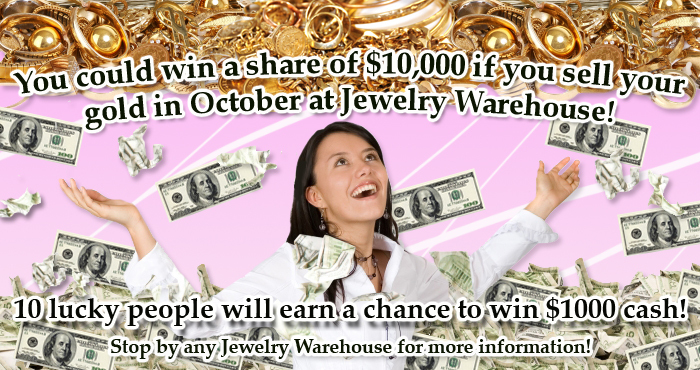 If you sell your gold to us during October, you will have a chance to win a share of $10,000! 10 lucky people will win $1000 each! So come in today and see how much money you can get for your old gold! Jewelry Warehouse is located in Harbison, Lexington, West Columbia, and the Northeast. Click here for the location addresses. If you won $1000, what would you spend it on? This entry was posted in Gold Buy Contest, Jewelry and tagged gold buy, jewelry warehouse buys gold, sell gold in columbia sc, sell your gold, selling your gold in columbia sc, selling your gold to jewelry warehouse, win $1000 if you sell your gold. Bookmark the permalink.